What’s the Most Cost-Effective Way to Reduce Fan Noise? 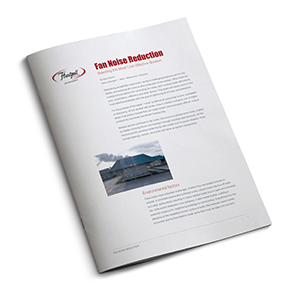 Maintaining acceptable noise levels can be challenging for any facility; reducing fan noise is often a key part of the solution. While there are multiple proven options for minimizing fan noise, each involves trade-offs among cost, convenience, efficiency and other factors. Here are three of the most common, plus advantages and disadvantages of each one. Full sound enclosures are insulated structures — almost miniature buildings — that fit over the fan itself. A well-built enclosure will reduce a fan’s noise level by 50 percent or more. In fact, the fan may not even be heard on the outside. Although enclosures offer the maximum level of achievable sound reduction, they’re also the most expensive. In fact, enclosures often cost more than the fan itself, so they’re typically used when no other solution can provide the needed sound reduction. In addition, they take up more space, which can pose an inconvenience. Insulated fabric covers known as sound blankets — custom-formed for your fan and held in place with Velcro® strips — can lower sound levels by 10 to 15 dB. While that’s not as much as an enclosure, blankets are less expensive, take up less space, and can also be used on ductwork. The primary disadvantage to sound blankets is that they must be removed and replaced for maintenance. This can involve removing many pieces of heavy fabric just to get access to the fan. Replacing the blanket is also challenging, since all the fabric pieces must be precisely aligned. Gluing plastic foam to the housing of a fan can reduce its noise output by about 10 dB. Foam wraps aren’t attractive, but they are cheap and efficient. They create few challenges for maintenance workers without significantly increasing the footprint of the fan. Wraps can also be combined with other solutions to provide more reduction if you need a little extra to hit your sound target. One drawback of wraps is motor noise, because the foam can only be glued to the housing, not to the motor itself. As a result, wraps can’t block motor noise as well as other solutions can. We understand that selecting the right solution for your site can be a challenge. Hartzell noise-reduction experts are available to advise you on the most cost-effective solution for your facility. Hartzell offers all of the major proven sound-minimizing solutions, including sound-reducing fan housings, enclosures, blankets, wraps, and more — all backed by AMCA certification. Download the full white paper or contact us to learn more.